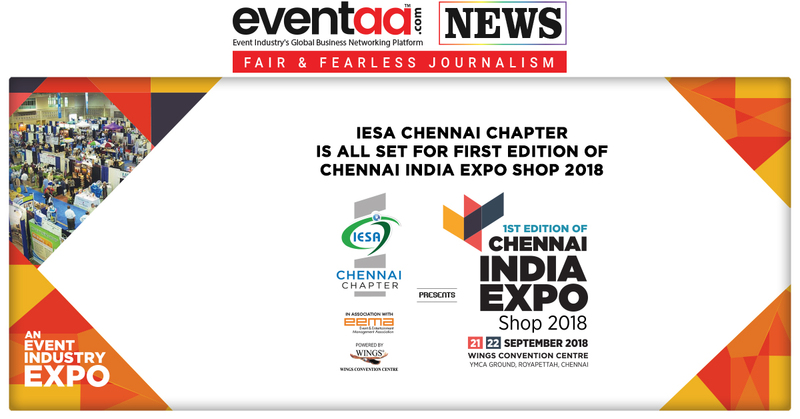 Indian Exhibitions, Conferences & Event Services Association (IESA) Chennai Chapter in association with EEMA and powered by Wings Convention Centre, is hosting one of India’s largest event Expo,“1st Edition of Chennai India Expo Shop 2018” in Chennai, on 21 September and 22 September 2018. The two-day expo will be held in Wings Convention Centre, YMCA Ground, Royapettah, Chennai, expected to witness over 2000 business visitors. The expo will be inaugurated by the "Nawabzada Mohammed Asif Ali - Dewan to Prince of Arcot, in the presence of Ms. VR. Subbulaxmi - Managing Director, Chennai Trade Centre, special invitees, Shri. M Shahul Hameed - Joint Director, Fire and Rescue Services, Northern Region, Shri. Sanjeev Pasricha - Executive Vice President, EEMA, Gp Capt. R Vijay Kumar (retd. ), VSM - Executive Director, Madras Management Association and Shri. Arun Samuel, Chairman & Managing Director, Wings Group Of Companies (Convention Centre), Shri. HK Bhattad – President, IESA, Shri. Vasisht - General Secretary IESA and Tarun Sardana - Treasurer IESA. Also, Sunttosh NM - President, S John Prabhu - Secretary, Goutham - Treasurer, James Anandh - Vice President, Arjun - Joint Secretary all from IESA Chennai Chapter, and many other eminent personalities from the events community of India, will also be a part of the inaugural ceremony. 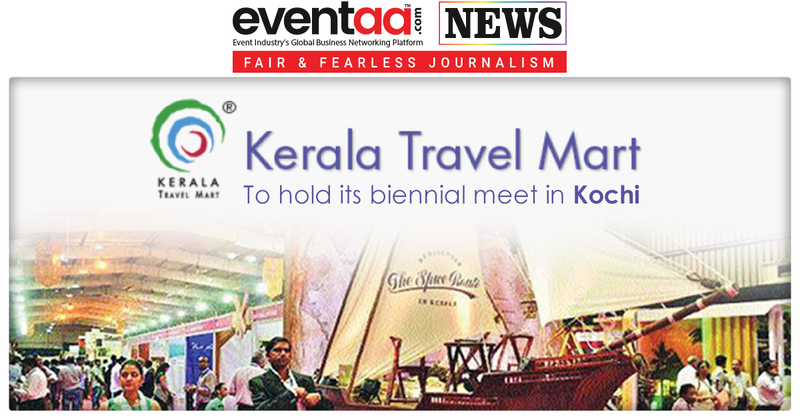 This Expo’s objectives are very simple, “Destination Chennai” is at the very heart of it. The event enablers of Chennai have joined hands to showcase the range of facilities, equipment and abundant talent available for the exponential growth of Chennai’s event industry. In providing a platform for the Event, Conference, Exhibition, Wedding Managers and service providers, be it Venue, Infrastructure, Decor, Stall Fabrication, Light & Sound, Furniture, Safety Product, Flooring Service and various others can share their experience and exchange ideas in order to maximise their potential for success. The Expo also aims to facilitate and encourage a collaborative approach, between the established players and startups from across the country and the world. 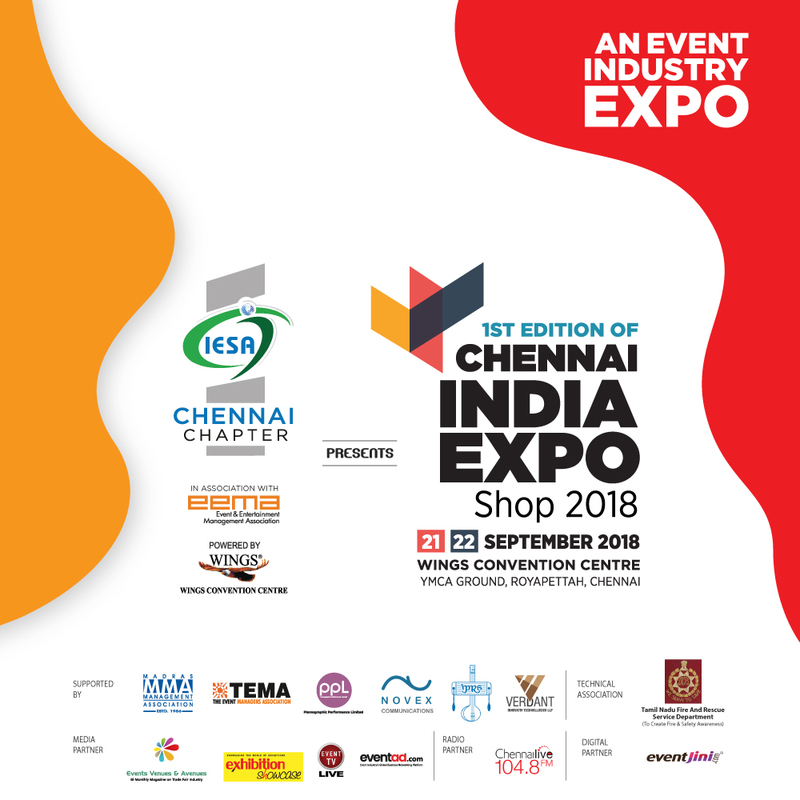 Through this Expo, IESA creates a widespread awareness of the opportunities Tamil Nadu has to offer, in the areas of event, conference, exhibition and wedding industry. This Expo, not only provides support to the event, conference, exhibition and wedding industry, but also independent service specialists like DJs, MCs, Insurances, Logistics, Sports and varied other event community players. 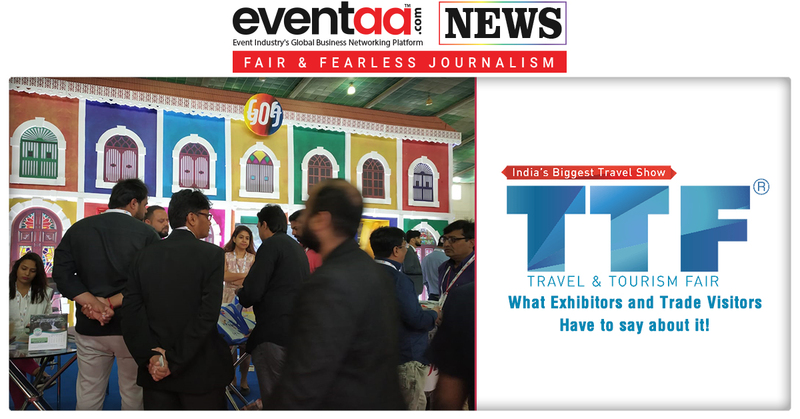 This Expo offers the first-ever opportunity to the Events Consumers, be they corporates, institutions, individual or anyone looking to explore this medium, moreover, it will be a quick walkthrough for event fraternity to explorethe potential this city offers.This would certainly make anyone visiting, a more informed Events consumer, thereby helping get the best out your budgets.